• ZamZam gold bearing zone has been traced on surface for a length of 215 metres averaging 15.97 g/t gold. 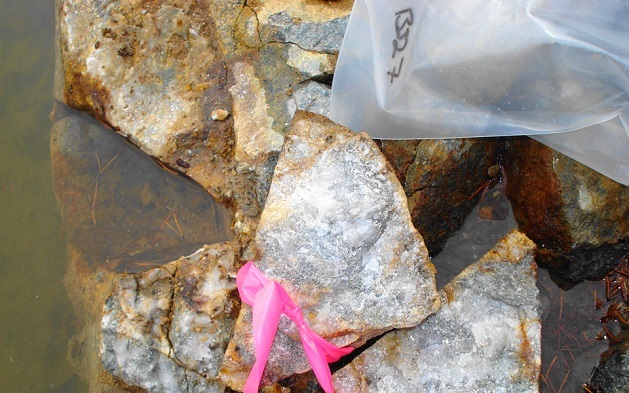 • Preliminary metallurgical testing shows 95% gold recovery from 8.72 g/t Gold head grade material at the ZamZam zone. • Gold and volcanogenic massive sulfide (VMS) potential. • Significant gold bearing fault structures over 1 kilometer in length with surface work and drilling confirming continuity of the zones. Open on strike and at depth. Our Carscallen Gold Project lies only 3 kilometres north of the PDFZ which influences the location of numerous gold and VMS deposits in the Abitibi Greenstone Belt. The property has been intermittently explored since the 1920′s. In 1926, Sydney Beanland and Frank Hurst discovered wire gold in thin quartz veins in the iron formation in the northeastern part of the present property. This discovery is known as the Wire gold occurrence. In 1934, the Shenkman vein had been discovered and traced over an exposed length of 120 feet. By 1946 the 1010 and Jowsey veins had been discovered. In 2006 Melkior discovered the Mystery Zone during a summer prospecting campaign with a grab sample assaying 84 g/t Gold. In the summer of 2007, Melkior conducted mechanical stripping of chargeability anomalies and discovered the ZamZam zone, which was exposed over a 55 metre strike length. The best assay was 843.7 g/t Gold. The rock types seen on surface and in core include granite/granodiorite, mafic volcanic rocks, iron formation (sulphide and oxide facies), quartz-feldspar porphyry intrusions/dikes and locally lamprophyre dikes. There are seven main gold zones recognized, going by the names of: ZamZam, Shenkman,1010 North and South, Jowsey, Wire Gold and Mystery. The gold mineralization mainly occurs within these corridors – typically in veins several centimeters to half a meter thick and grading between 1 to 100 grams of gold per ton (g/t), but as high as 843.72g/t.